Click thumbnails to change main image. 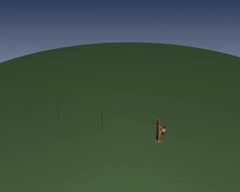 The Gallagher SmartFence 2 is the best and easiest to use alternative product to netting for sheep and other livestock. A revolutionary design where posts, reels and wires are combined into 1 product that is quick and easy to put up and to take down. This is as close as you can get to an "instant fence". The Gallagher SmartFence 2 is easy to carry and store away when not in use and combined with a solar powered energsier, it would be difficult to find an easier way to set up an instant usable electric fence of whatever length you need, up to 100m. If your requirement is longer than 100m, then multiple Smartfences can be linked together. Although designed for sheep, goats and cattle, the Gallagher Smartfence has proven a useful tool for pig fencing, hedge protection, grazing in orchards, temporary paddocks for various animals, strip grazing and more. Equestrian customers have used the Smartfence to create small temporary horse fences while at shows; some users have suggested wrapping a few short lengths of "left over" fence tape around the top line for extra visibility.